How to view timesheet submission, lock form, determine overtime and undertime, etc. a. Inside Project – From your Dashboard or Construction tab, click View on Timesheet tile. b. Outside Project – From your navigation bar, go to Management > Reports > Timesheet Report. Or you may search for ‘Timesheet Report’ on the search bar located in the upper right corner of the portal. a. Project Name – Submissions displayed are related to the selected project name. Change of project name in this filter is only applicable to timesheet report outside project. Once you are inside your project, all submissions displayed are limited to that project only. Project name filter is disabled. b. Employee Name – Displayed will be the timesheet submissions of the selected employee. c. Cost Centre – By default, All Cost Centres displays options of cost centres from GPC and CPPC Cost Centres library. When you change the project name on the filter, cost centre filter displays options of cost centres from PCS Cost Centres library. d. Start Date and End Date – This filter is used to limit the display by specifying the time range of submissions. By default, the date displayed will be the current date. a. You can edit directly on the table by clicking the field and updating the details. b. Cost Centre is dependent on the Project Name. When you update the project name, the cost centre options will also update. c. Updating the start time and end time, and break, updates the Total Paid Hours column. d. Updating the Total Paid Hours clears the value for start time, end time, and break. e. You can delete timesheet submissions using the Delete button. f. When Export to Excel button is clicked, an excel file of the timesheet submissions will be downloaded. Summary of Employees displays the total hours per employee. Clicking the Total Hours displays another window that shows the breakdown of the timesheet submission (per cost centre). Summary of Cost Centre displays the total hours per cost centre. Clicking the Total Hours displays another window that shows the lists of employees who worked for that specific cost centre. Daily Summary displays the employee’s timesheet in a week and their total hours worked. 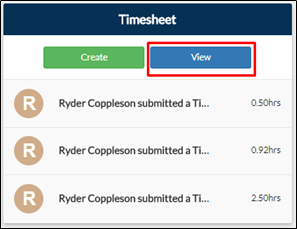 This feature is located in the upper right corner of the timesheet report page. a. Lock Form Date Access – Only the owner can use this feature. To use this function, you just need to choose users who will be allowed to lock the timesheet form. Users listed here will now have Lock Timesheet Form Up to this Date field on their report. b. 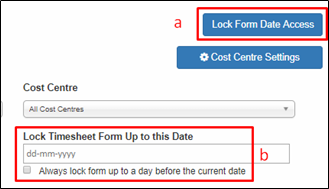 Lock Timesheet Form Up to this Date – specifies up to what date are the timesheets locked to your employees. Ticking the checkbox will lock the timesheet except for the current date. When a timesheet is locked, it means that an employee can no longer submit a timesheet on or before the specified date. Example: You locked the timesheet up to March 1. Now, your employees can no longer submit timesheet dated on or before March 1. They can only submit timesheet for the dates March 2 onwards. This feature allows you to modify the business hours to determine undertime or overtime hours. Timesheet submissions that are beyond the time range will be highlighted in YELLOW. You can set your business hours using the Start Working Hour and Finish Working Hour.